Walking away from someone you love is one of the hardest things to do. It’s especially hard when you feel like you’re being pulled in a hundred different directions. Somehow the things you desire get lost in the muddled opinions of your friends, family, and society. There always seems to be a disconnect between the head and the heart. It took me a long time to accept that what I wanted for my life and what God wanted for my life could be two different things. I wrestled with the idea for years. I wanted my relationship to work so badly. I prayed for my boyfriend constantly. I prayed for our relationship. I prayed for God’s will in my life. I prayed for God’s will in our future together. So why wasn’t it working out like I had hoped? Here’s a little background. We began dating when I was a senior in high school. From that point on we had a consuming, passionate, hit-you-upside-the-head kind of love that you secretly envy in the movies. Don’t get me wrong, we definitely had our fair share of ups and downs, but there was something about us. We came from different church backgrounds, but to me, that didn’t matter because we both loved God. We couldn’t get enough of each other. We loved spending time together. We could talk for hours upon hours. We made each other laugh. We put up with the good, the bad, and the ugly sides of one another. He made me feel so loved, so cherished, so cared for. He understood me. He knew me. He knew what made me feel alive and what broke me down. He supported me. He was my best friend. He made me feel at home. I loved loving him, and he loved loving me. Naturally, we began making plans for the future. At first they started out as naïve fantasies. As the years passed and we grew older we longed to make those dreams a reality. But somehow, deep down, there was always something holding us back. I began to picture my future in every way with him in it. My deepest fear was losing everything we had built up together. I wanted so badly to be with him that I desperately tried to make him fit into the puzzle of my Christian life, but whichever way I tried, he didn’t quite fit. I started to try and control things. I had a checklist: go to church together, read the Bible together, pray together. He went along willingly, but we continued to struggle. After that I tried to fix the parts that didn’t work. Then I started making excuses. Eventually we avoided confronting the strain on our relationship altogether. We pushed aside our differences and tried to maintain a loving relationship. We got really good at ignoring the warning signs. We tried to break up in college, but we ended up back together. We were magnetic. You couldn’t keep us apart for too long before we came running back to each other. He was the first one to be honest about the reality of our situation. He had realized that he couldn’t be everything I wanted, everything I needed. He felt just as strongly about his beliefs as I did about mine. The problem was that I wanted us to see eye to eye spiritually, and he wasn’t sure if that was something that could ever truly happen. The moment he told me how he was feeling, my heart felt like it was breaking into a million pieces. I didn’t want this to be happening. We debated for weeks, avoiding the inevitable and trying everything in our power to make things feel normal. I didn’t know what to think. I didn’t know what to do. But I did know one thing— a breakup wasn’t what I wanted. I couldn’t bear to think of a life without him. We had lived through six years of life together. We were supposed to work out. We were supposed to get married and start a family. We were supposed to grow old together. If you love someone, you figure out a way to make it work, right? I became exhausted—emotionally, mentally, physically, and spiritually. Suddenly it dawned on me. There comes a point where you have to step back and realize that it’s not healthy to be constantly fighting and trying to make the other person understand. Is it more loving to stay together, or let each other go? Is this the life we wanted, always feeling the the need to defend our beliefs? I slowly began to grasp the fact that I needed to let him go. I needed to say goodbye. But how could I let him go, when I loved him so much? I struggled through this quandary for months. Summer came and I found myself accepting that I needed to let go of my plans, despite how terribly I wanted to hold on to them with every ounce in me. I knew that just simply loving each other wasn’t enough. Breaking up wasn’t his decision or mine, it was a conclusion each of us came to separately. I sat in the stillness trying to find the right words to say. I told him we couldn’t think like that and that sometimes these kinds of things happen. I felt like our relationship was a maze and we kept hitting the same dead end over and over again. We kept fighting the same fight. My heart broke over and over again as I thought of the past memories, the present situation, and the future that would never be. I cried. I cried for the family we wouldn’t have. I cried for the plans we had made that wouldn’t be reality. Why did this have to happen to us? I was stunned. I begged to figure it out. There must be a solution. But there wasn’t. I knew I needed to let him go, but I so desperately didn’t want to. We talked about how we felt like we were different. Had others ever felt the way we felt about each other? Why did we hold on so tightly? Would it ever not hurt? When would the pin pricks of sadness stop? It just wasn’t fair. We talked about how it didn’t make sense and that we never thought we would be in this place, walking away from our relationship. We sat there, never wanting the night to end. He stroked my arm and nerves trickled up and down my body as I realized I wouldn’t be feeling that touch any longer. I touched his face trying to memorize every feature, every dimple, every freckle. How was I going to get through this? I’d been with him for so long. How could I let him go? We had been through so much. We had faced so much together, so how could it really be over? How do you do this? I sat there and cried as I thought about all the things I was going to miss. We sat there in more silence, thinking, holding each other for one of the last times. How do you say goodbye when you still love so deeply? Was this really it? This was so hard. We continued to avoid the approaching farewell. I didn’t want to do it, but I knew we had to. Was this all a dream? Why? Finally I took a deep breath and said it was time. We got out of the car and stood beneath the moonlight, holding each other. I squeezed tighter and he squeezed tightly back. We stood there looking at each other. My heart sank once more. I tried to put all my emotion, all my love, everything I had held onto into that last embrace. He began to pull away, acknowledging that at some point it would all have to end. He said, in deep sadness, almost in a gasp, that he felt like we had failed. I kept reassuring him that we hadn’t. We loved each other passionately and unendingly, and unfortunately we still had to walk away. I fought back more tears. “I don’t want to have to let you go,” I whispered. “You have to,” he stated back quietly. The next thing I knew, we were saying goodbye, only holding hands as we stood across from each other and slowly backed away. He turned and walked to his car, as I walked to mine. I watched him drive away, tears streaming down my face. That was it. We were no longer. We had finally let each other go. I drove home in disbelief about what had just happened, emotionless. I felt like a zombie—like I was living, but not truly alive. I had done the hardest thing. I had let go of the life I thought I wanted, the life I thought I would have with the person I loved. I walked away, knowing it’s going to hurt for a long time. There are shivers of sadness that hit me everyday. I feel lost, out of control, sad, and confused. But I have to be strong. I have to believe that God has a plan greater than my own. I have to believe that there is someone out there for me, even if it wasn’t him. I have to believe that God will provide a relationship in the future that fills the void I was always trying to fix. I have to take a step back, and stop trying to control God’s handiwork in my life. I have to continue believing and trusting full-heartedly that God is faithful, He will provide. One of my favorite bloggers and an inspiration for starting my own blog, is Stephanie May Wilson from StephanieMayWilson.com. Today, I’m excited to share with you something that Stephanie has been working on for a long time—her very own eBook, The Lipstick Gospel, A story of finding God in heartbreak, the Sistine Chapel, and the perfect cappuccino. I had the opportunity to read it between a long weekend visiting a good friend and a delayed flight home. I was so impressed with The Lipstick Gospel that I wanted to share it with you! It’s the perfect companion to your favorite drink. The Lipstick Gospel is a quick read—perfect for cozying up with on a cool autumn afternoon. 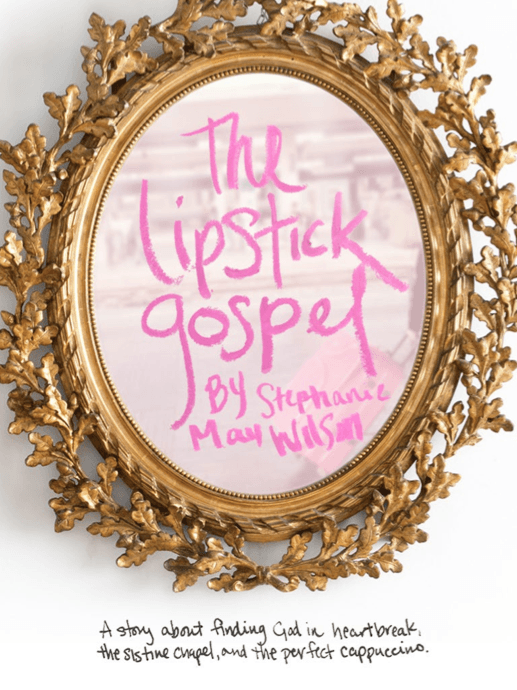 Go ahead, take a break from the craziness of the season, grab yourself a glass of red wine, a pumpkin spice latte, or some hot cocoa and get reading…The Lipstick Gospel won’t disappoint! Reading Stephanie’s story is like catching up with an old friend. There’s something about Stephanie’s writing that is so endearing, it feels as if you’ve known her forever. Stephanie doesn’t sugar coat things. She tells it like it is. She’s just the right amount of humor and authenticity all wrapped up into one. You’ll find yourself quickly turning each page as you learn more and more about Stephanie’s journey. It’s a story of God’s love, redemption, and letting go. The Lipstick Gospel is Stephanie’s story of how she found God in the midst of heartbreak, confusion, and sorrow. Stephanie invites you into the process she went through—the ups, the downs, and everything in between. Stephanie recounts a beautiful story of hitting rock bottom, traveling, finding God’s love, experiencing His redemption, and learning to let go. It meets you where you’re at. As I read The Lipstick Gospel I found myself in awe of how relatable Stephanie’s story was to my own current experiences. I am both inspired and comforted knowing that I’m not alone in my journey. Whatever you’re going through, wherever you’re at, The Lipstick Gospel is sure to encourage you. Best of all, The Lipstick Gospel is a free eBook! Click here to get your own copy. All you have to do is put in your email address, click “yes, subscribe me to this list” in the email Stephanie sends you, and then you’ll be redirected to the page where you can download the book. It’s formatted as a PDF so you can read it on your phone, tablet, computer, or even print it out! My hope is that you find yourself as encouraged and inspired as I was after reading The Lipstick Gospel. I pray that God uses Stephanie’s story to teach you more about His grace, truth, and love. After you read it, I’d love to hear what you think. Happy reading!